The down side to having both a blog and a podcast is that I think I'm done talking about a project when I do it in one place or the other! 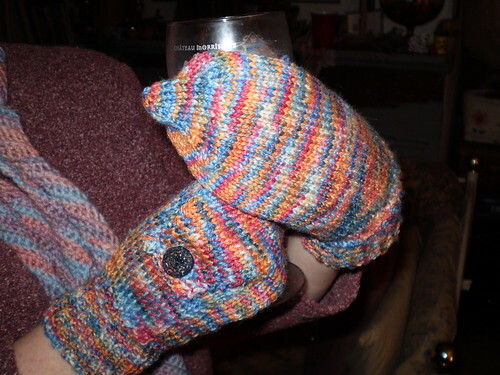 I posted about Eve's Mitts here last week and forgot to talk about them on the podcast, and then I talked about these on the podcast and forgot to put it here. Not good when folks are wanting pictures! Anyway, above is the before blocking picture of the mittens I made for myself out of Natalie's hand painted bamboo/merino blend. 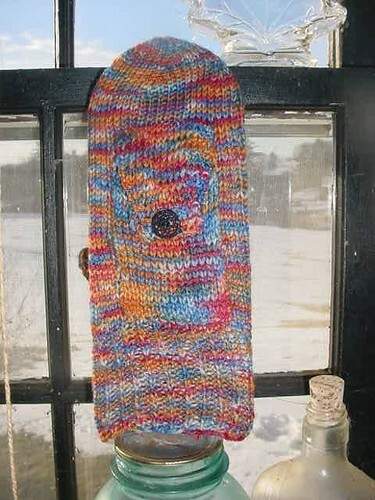 The pattern is Subway Mittens by Colleen Michele Meagher which appeared in the Interweave Knits Accessories 2009. As you can see, there's something a bit weird about the top of the hand and thumbs of these little things. So, presto, thanks to an episode of Knitting in the Round, I know how to fix that! I put in an order with Seven Yaks Design for a set of their mitten blockers. They arrived yesterday (very fast shipping, excellent packaging and some cute little decals attached to the address label) and I just couldn't wait to get my mittens up on them. 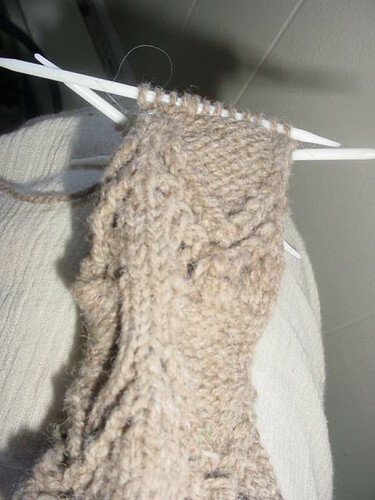 As you can probably see, the shape is much more "mittenish" on the blocker. I took them off this morning because thanks to the light acrylic construction they dried fast. There's an extra little thumb piece that is also a inch gauge for yarn included and two little needle gauges in metric and American cut out of the center of the mitten blocker. There's also a diz with several size holes for making different sized rovings. I never had a WPI gauge or diz before....too cool. The only thing I didn't like is that the ribbing got stretched with the rest of the mitten. Easy to fix...I just wet the bottom again and now they're laying flat to dry with the ribbing bunched into shape. I just wet the ribbed part again, mind.... I'll post a picture when it's dry to show how that worked. I do love this pattern and yarn. The mittens are light, useful and warm! Speaking of photos, there has been a tragedy at Greenberry House. The SO decided he needed a new web site, so he borrowed my treasured Olympus digital camera, given to me by the wonderful father of the one and only Jagasaurus. And he dropped it. I might start speaking to him again someday. It doesn't work anymore and I can't afford to get it fixed right now (neither can he) so I had to drag out the trusty old Sony Mavica. It works......just doesn't take the awesome photos that the Olympus did. So there will be a distinct lack of beauty around the top of Squirrel Spur Road for awhile. The January thaw has arrived and we're seeing bare earth again. And mud. There's still plenty of snow yet to melt but I'm grateful for some warmer temperatures. It's been nice to get back to our early morning walking routine. Yesterday I went a little mad and washed half the California Variegated Mutant fleece I bought at Estes Park in June. It weighed 7 pounds before washing and wasn't very greasy so there's still a lot left. I'm thinking of making spinning this entire fleece my goal for Ravelympics 2010. What are Ravelympics, you ask (or maybe not but I'll tell you anyway)? Ravelry members that want to do something amazing during the two weeks of the 2010 Winter Olympics in February will be gathering into teams and competing in knitting and spinning "events" designed like Olympic events. 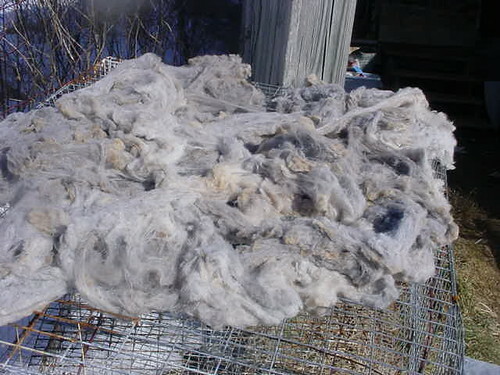 The picture shows about a third of what I got washed...which means it's about a sixth of the entire fleece... So I'm in training for the gold, which means I have to get this washed before the start of the Olympics and carded if it needs to be done. We'll be talking about it during the podcast and Natalie and I are on Team Sasquatch. Right now there is wool draped everywhere in my house drying. It wasn't quite as warm as it seemed outside yesterday! The only other project I have on hand right now, besides the lovely Larkspur Wrap Sweater I talked about last post is another set of mittens for me. I have these mitten blockers now, ya know? I've made the cuff of this mitten FOUR times....in two different yarns. Just can't seem to get gauge in the yarn weights suggested by the pattern. The pattern is lovely if I can get it to work out. It's from Spin-Off Spring 2009 and is a design called Clun Forest Mittens by Pattern: Clun Forest Mittens by Carol Huebscher Rhoades. Clun Forest is a breed of sheep. In going back to the magazine and reading the articles about it I'm wondering if my problem is that the yarns I'm trying to use aren't as "springy" as the down breed Clun Forest. Or it could be I'm just not good at gauge!